It wasn’t my first time to travel alone in a foreign country but as I disembarked from our plane to start my solo journey in Myanmar, my emotions got ecstatic and edgy. My previous solo travel experience had been an easy one mainly because my destination then was a first world country. Myanmar is a different one. The country has just opened up with regards to tourism. I didn’t have expectation of getting a relaxed travel or some sort but taking a glimpse of how the country looks like through images and stories online, I had this high hope that this journey will going to be a fulfilling one. Yangon was my jump-off point, the former capital of Myanmar. It is located at the lower part of the country. It is the country’s main domestic and international hub for transportation. It is also the country’s center for movie, music and media. The city also serves as the country’s main point for trade, business and tourism. It was already late when I had arrived in the city, hence what I had only able to do during my first night was to eat in one of the eateries that is located nearby the guesthouse where I was staying, as well as had a glimpse of what the neighbourhood looks like at nighttime. I had also able to have a sight of the famous Shwedagon Pagoda lit when my airport transfer vehicle passed by the street that goes to the famous pagoda. It was the next day when I had begun exploring the city and visited some of its tourist spots. 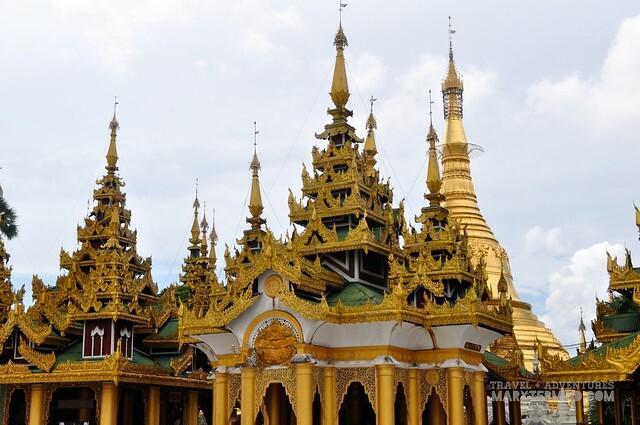 Yangon has several notable sites, may it be pagodas, parks, museums or theaters. But amongst these numerous tourist attractions, I had only opted to visit a few that I think are must see in the city. 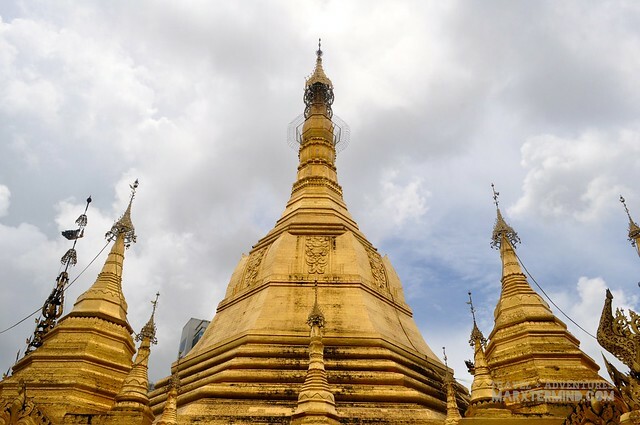 The Sule Pagoda is a Burmese stupa, which is situated in the heart of downtown Yangon – specifically at the junction of Sule Pagoda Road and Mahabandoola Road. It occupies the center of the city and was said to be an important landmark in modern Burmese politics, ideology and geography. It is also part of the city’s economic and public life. This important landmark is just few minutes’ walk away from Chyan Myaye Guesthouse. From the guesthouse, I walked through the busy streets of downtown Yangon and in about 5 minutes or so I had able to reach this important site. This site is open from 4:00 AM to 10:00 PM daily. Foreign tourist has to pay an admission fee of MMK 3,000 per person. After paying, you may proceed inside and roam around the pagoda and disregard the people selling floras and asking for donation. 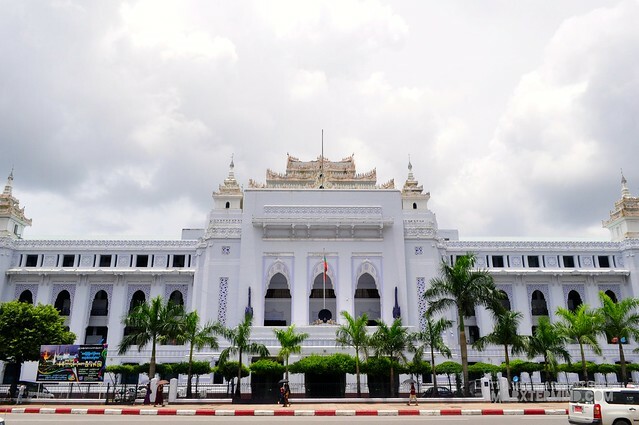 A site that is nearby Sule Pagoda is the Yangon City Hall, which I’ve found imposing because of its architectural design. The city hall is located just across the famous pagoda. Bogyoke Aung San Market, which is formerly known as Scott’s Market, is a major marketplace located in Pabedan Township. 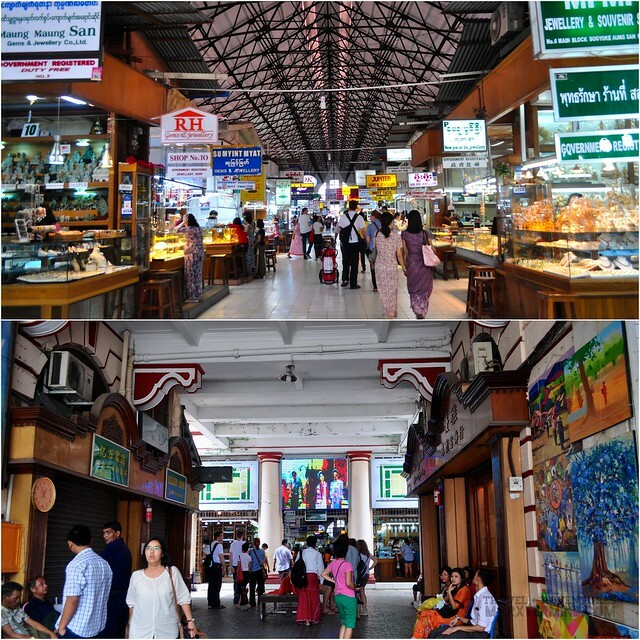 This marketplace is a major tourist destination in Yangon. 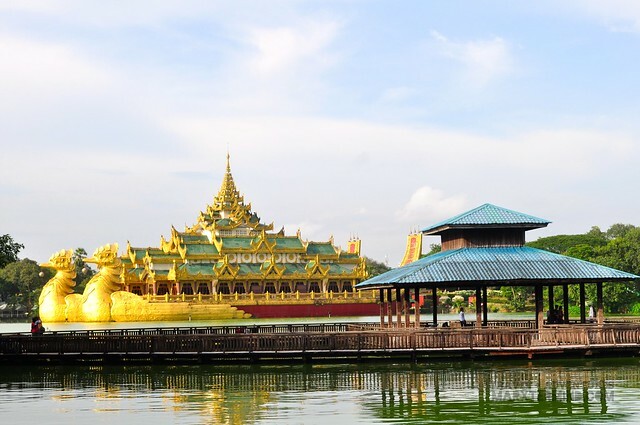 It is dominated by antique, Burmese handiwork and jewelry shops, art galleries, and clothing stores. The market also has several stores for local shoppers, selling medicine, foodstuff, garments and foreign goods. The market was also said to be a popular black market location to exchange currency. I’ve bought a shirt and a ref magnet, which cost MMK 2,500 and MMK 1,000 respectively. 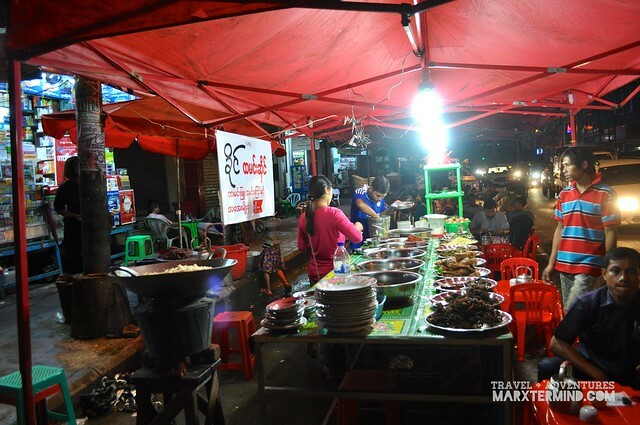 If coming from Sule Pagoda, walking through Sule Pagoda Road and taking Bo Gyoke Road will get you to this marketplace. I had able to reach this main bazaar after walking for about 15 minutes. 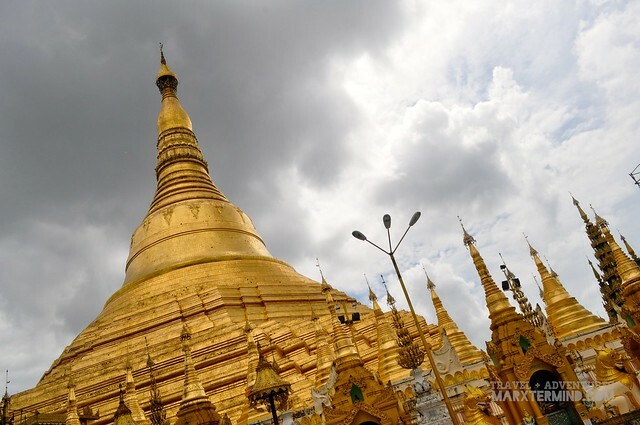 The Shwedagon Pagoda is a gold-plated pagoda and stupa that stands close to 110 metres in height. 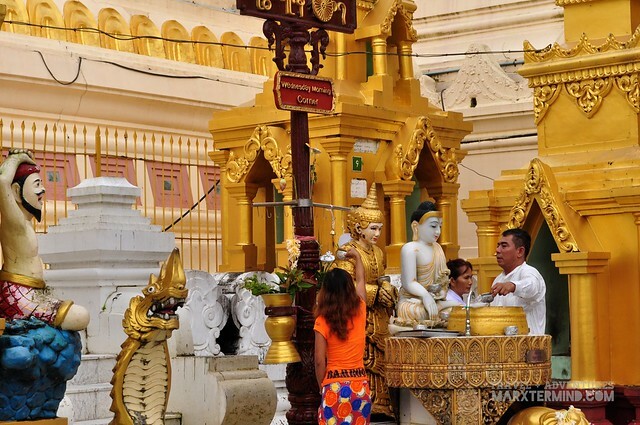 It is the most sacred Buddhist pagoda for the Burmese with remnants of four past Buddhas treasured within: the staff of Kakusandha, the water filter of Koṇagamana, a piece of the robe of Kassapa and eight strands of hair from Gautama. This significant site is located in Dagon. It is open from 04:00 AM to 10:00 PM daily except from some specific events that it is open 24 hours. Foreign tourist has to pay an admission fee of MMK 8,000 per person. There’s a dress code to follow when visiting this important site, visitors should dress appropriately and modestly. Expect to be barefooted when entering the pagoda. The receptionist of the guesthouse where I was staying had told me that it’ll take me half an hour of walk to reach the Shwedagon Pagoda, but after walking for about 5 minutes from Bogyoke Aung San Market, I gave up and hailed a cab to take me to my destination. I couldn’t stand the scorching heat (bringing of umbrella is a must in Myanmar) and I assumed paying for a taxi once in a while wouldn’t hurt my budget so much. The taxi ride, which took about 10 minutes, cost me around MMK 2,000. It was reasonable enough, I think! After paying the admission fee, a man who speaks well in English approached me and asked if I need a guide to tour me around the pagoda. He told me that the payment for the service will go to an organization and he was just volunteering to do it. I didn’t have a plan to get one so I humbly refused his offer. In the first place, I didn’t have much budget to get a tour guide. 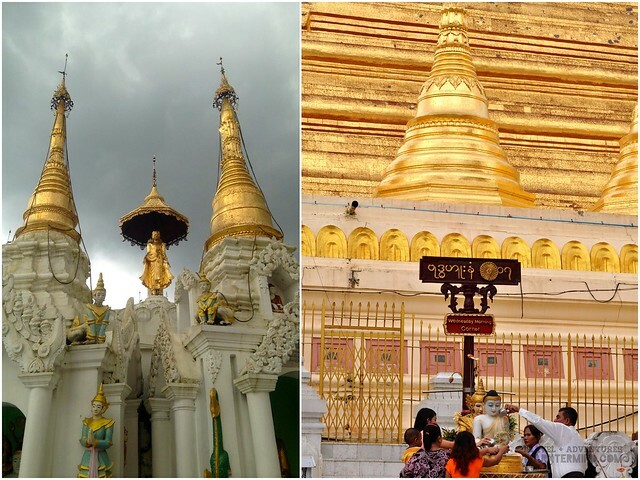 The stupa is covered with hundreds of gold plates. The top of the stupa is coated with 4,531 diamonds; the largest of which is a 72-carat diamond. It is unmistakably one of the marvels of the religious world. 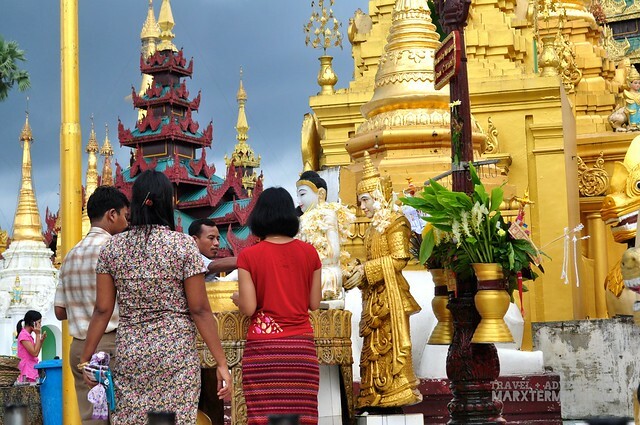 It was said that this site is a repository of the best in Myanmar heritage – architecture, sculpture and arts. This place also consists of hundreds of interesting temples, stupas, and statues that mirror the architectural era of Myanmar. 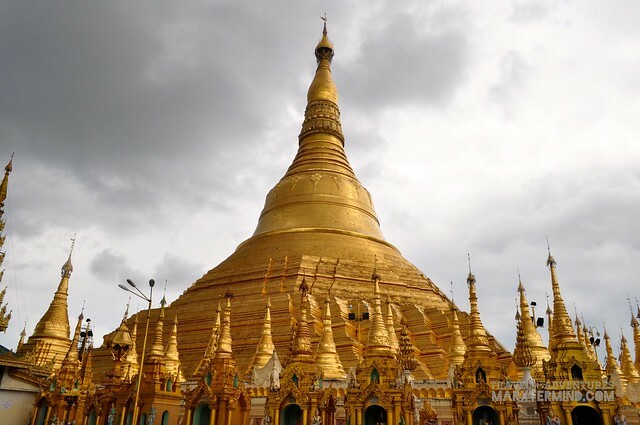 A visit in Yangon wouldn’t be complete without seeing this 2,500 year-old pagoda. 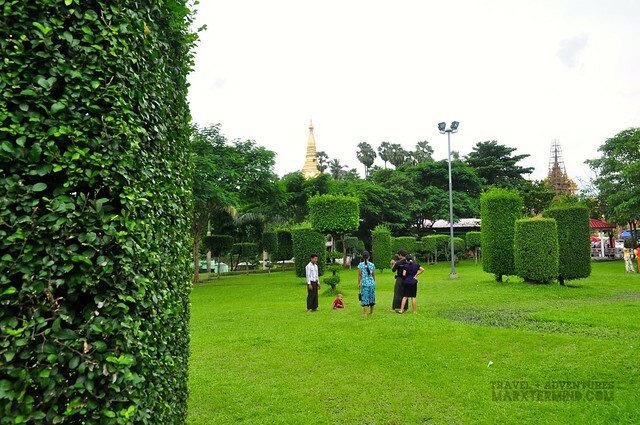 Close to the popular site of Shwedagon Pagoda is where Kan Taw Mingalar Garden is. Locals find it an ideal place to wind down from the busy life of the city. The compound has a beautiful lake bordered by green surrounding. The area also has some recreational activities. There are also restaurants located within the vicinity. 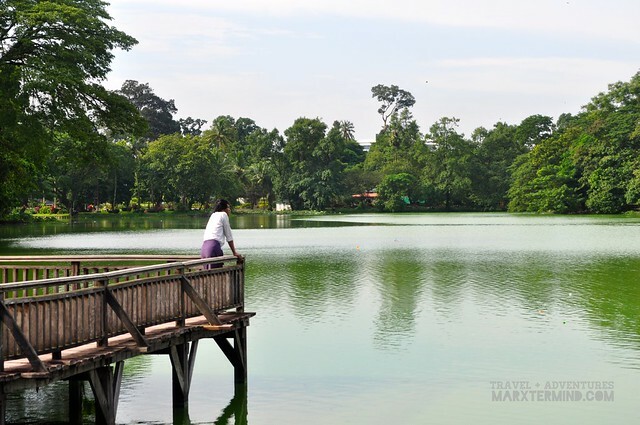 Kandawgyi Lake is one of the major lakes in Yangon. 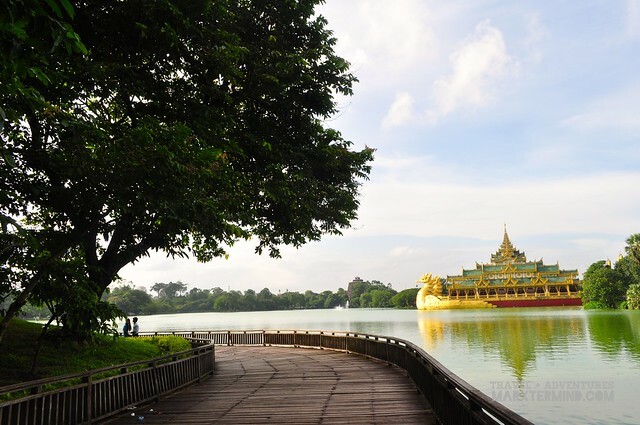 The lake is located east of the Shwedagon Pagoda. The lake is said to be an artificial. 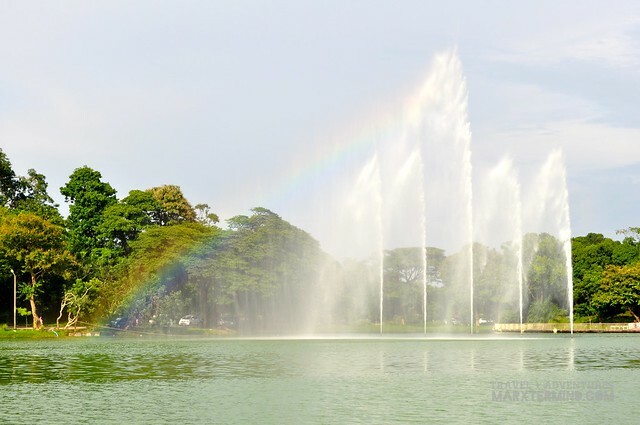 The water from Inya Lake is channeled through a series of pipes that goes to this lake. It was made to provide a clean water source to the city during the British colonial administration. Kandawgyi that means “the great lake” in Myanmar is a well-known place in the city. The lake is 150-acre in size. 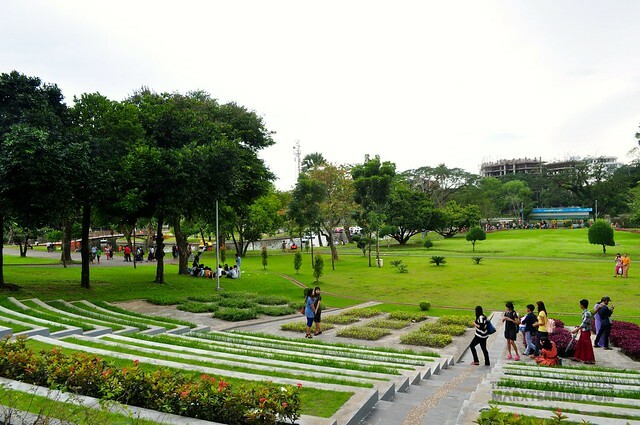 It is surrounded by a nature park and a zoological garden. From Shwedagon Pagoda, I took U Htaung Bo Road to get to the lake. I walked for about 15 minutes to reach the area. There’s no admission fee to visit the nature park. The place is a beautiful spot to go on picnic or simply have a walk, which what I did during my visit. The beautiful lake is kept and preserved, which keeps the exquisiteness of the natural lake. 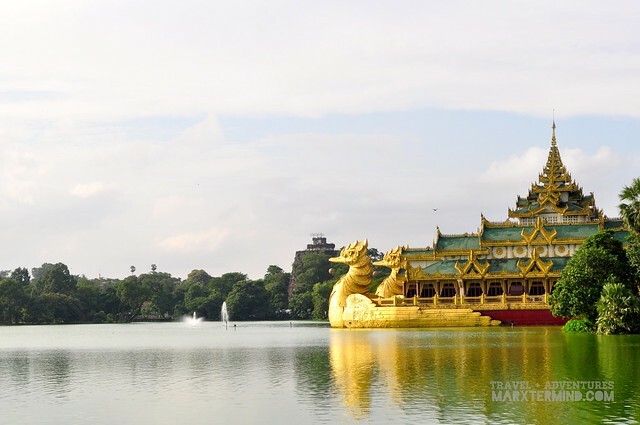 Karaweik Hall is a palace situated on the eastern shore of Kandawgyi Lake. 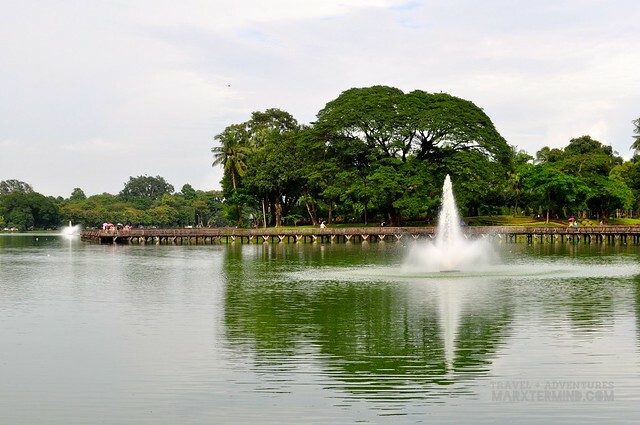 It is one of the landmarks of Yangon. It was covered with gold about 20 years ago. 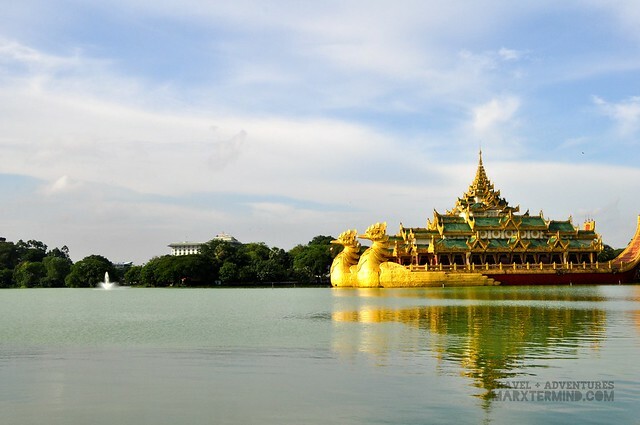 It was said that it was designed by a Burmese architect U Ngwe Hlaing, who based it on the Pyi-gyi-mon royal barge. The palace houses a buffet restaurant today. There are also traditional dance performances being held in the palace, and are normally during evening. 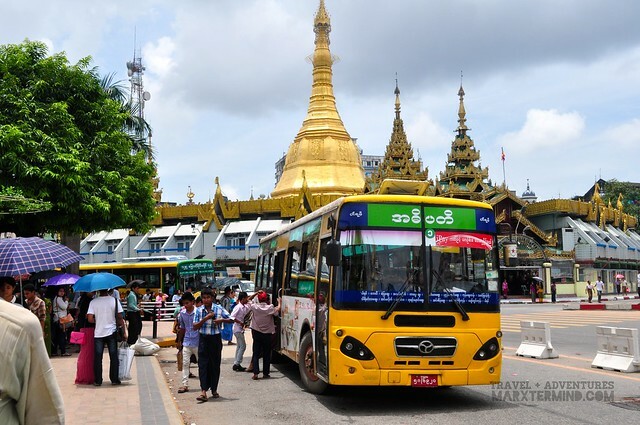 I’ve thought of visiting two more sites, which are Chaukhtatgyi Paya and Yangon Chinatown Market, but I was already constricted with time because I still have to catch my bus ride to Bagan, which is scheduled to depart at 8:00 PM. After seeing the Karaweik Hall, I went out of the nature park and hailed a cab to take me to my guesthouse, which is in downtown. It was already nearing 7:00 PM when I left the guesthouse. I lost sense of time that I forgot that travel time to get to the bus station may take up to an hour. Luckily, I was able to make it before the bus departed to Bagan. 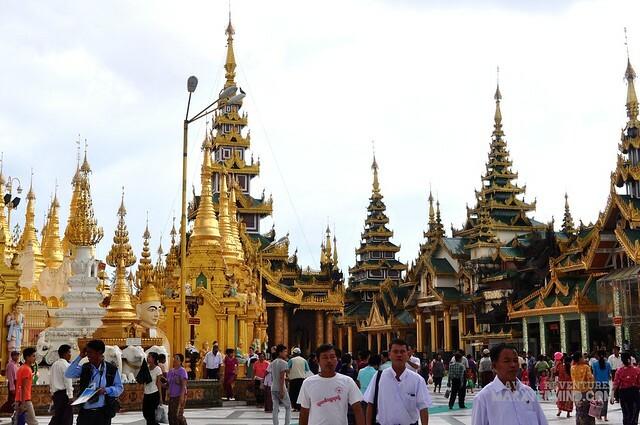 Spending only a day in Yangon was frankly a short one to sightsee every important sites of the city. There are other attractions and activities that I have in mind that I had actually ditched off because of my limited time. Nonetheless, my jaunt in the capital city of Myanmar handed me with a nice impression about the country. My first day in the city lifted my enthusiasm to continue my journey and experience Myanmar. Nice photos! Ganda ng mga pagoda! nakakayaman tingnan ang gold. haha!